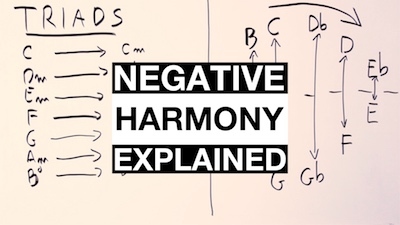 Negative Harmony is a very simple concept that has been made unnecessarily complex. You may have heard about Negative Harmony (after all, it was all the rage on YouTube a while ago) and maybe you tried to understand it. But for all the talk about it, there are still very few resources that actually explain it! Most people came away with the idea that Negative Harmony is an abstract or brainy concept reserved to geniuses. In reality, everybody can use Negative Harmony in their music - it's not difficult to do as long as you can play a few chords on your guitar. You can find everything else in the video below. In this video you will learn what Negative Harmony is, how it works, and how you can use it in your music. I play plenty of examples so you can hear how it sounds, and see how to use it in practice. As you can see, Negative Harmony becomes more and more powerful if you have a solid knowledge of 'Positive' Harmony i.e. the 'standard' Harmony. To REALLY learn your Harmony not as theory but directly on your guitar fretboard, have a look at the Complete Chord Mastery Course. Many students already reported how this course has been a game changer for them and how simple Harmony becomes when you learn it the right way - and it can do the same for you.